Naguib Kanawati (Project Leader and Co-Investigator, Macquarie University). Full Profile. Linda Evans (ARC Australian Postdoctoral Fellow, Macquarie University). Full Profile. Alexandra Woods (Co-Investigator, Macquarie University). Full Profile. Gay Robins (Partner Investigator, Emory University). Full Profile. The goal of the project, which is funded by the Australian Research Council (ARC), is to produce the first comprehensive archaeological and analytical study of Meir, one of the best-preserved cemetery sites in Egypt, in order to assess local community response to the turbulent transition from the Old to the Middle Kingdom period. This exhaustive investigation is intended to generate new information about the social and political mechanisms that enabled Egypt's unique cultural traditions to endure. Meir is situated in Middle Egypt, on the west bank of the Nile within the ancient province of the Nedjefet tree (the 14th Province of Upper Egypt), approximately 350 km south of Cairo. The region is acclaimed for the richness of its agricultural land, a characteristic that was recognised and exploited during the pharaonic era and enabled Meir to become a major economic and administrative centre for the entire country. The fecundity of the province also led naturally to a strong association with Egypt's goddess of fertility and nourishment, Hathor. The necropolis, which is located beyond the arable zone on a steep incline at the edge of a desert plateau, housed the rock-cut tombs of local rulers from the 6th to the 12th dynasties, as well as those of administrative and religious officials (especially overseers of the priests of Hathor). The cemetery consequently represents a cross-section of the administrative and social leadership of the entire province over a broad timeframe. The cemetery at Meir was first investigated by Ahmed Kamal in 1910 (Kamal, 1914; 1915a,b), and then excavated systematically by Aylward Blackman between 1912 and 1950 (Blackman, 1914-1953). Blackman divided the mountain into five consecutive tomb groups running north-south, which he labelled A to E. Within these sectors he uncovered a range of well-preserved and beautifully decorated tombs dating from the Old and Middle Kingdom periods. Blackman's published record shows, however, that he concentrated almost exclusively on large and spectacular tombs, ignoring those of lesser size or quality. Nevertheless, Blackman's incomplete excavation record is currently the only authoritative source for what is widely regarded as one of the best-preserved Old and Middle Kingdom sites in Egypt. A 2008 survey of the site, which was carried out by the Australian Centre for Egyptology (ACE), revealed that Blackman either missed or deliberately avoided excavating certain sections of the cemetery. This preliminary work uncovered two small tombs, overlooked by Blackman, which date to the First Intermediate Period, hinting that the cemetery at Meir was used continuously from the Old Kingdom through to the Middle Kingdom (unpublished data). This was confirmed by Naguib Kanawati in November 2009, with the re-discovery of the tomb of Hepi-Kem. This major structure, which is located between the Old and Middle Kingdom tomb sectors (A and B), was originally uncovered by Blackman, but due to its "foul odour", was not recorded and subsequently lost. Hepi-kem's chapel is exceptionally large and well cut - to date, it is the largest found at the site - yet, unlike his subterranean burial chamber, it is completely devoid of decoration. Dated to the end of the Old Kingdom, this highly unusual tomb, with its contradictory combination of ostentatious size and impoverished adornment, opens up many new questions about conditions during the First Intermediate Period and their subsequent effect on cultural traditions. A number of small, undecorated tombs were discovered in its vicinity and contain inscribed wooden coffins which add to our knowledge of this poorly studied period. These recent findings establish Meir as one of only a few Egyptian cemeteries with evidence of continuous use over successive historical periods. Unlike other regional necropoli, such as Deshasha, El-Hawawish, Sheikh Said, Zâwiyet el-Mâytin, and Deir el-Gebrawi, which were abandoned after the collapse of the Old Kingdom, the cemetery at Meir remained in use. The site consequently bridges the stable conditions of the early Old Kingdom period, the disintegration of Egypt's social and political structure at the end of the 6th dynasty, its apparent descent into chaos during the First Intermediate Period, and the country's subsequent reunification and rise in the 11th and 12th dynasties. record one of the best-preserved and longest-lasting cemetery sites in Egypt according to modern standards. During the first year of the project, we focussed on the Old Kingdom structures at the site. Re-recording (surveying, photography, and facsmilie drawings) of the Sixth Dynasty tomb of Pepy-ankh-hery-ib was completed during the Year 1 field season (November, 2011-February, 2012) and the resulting plans, photographs, line drawings and description prepared for publication (see Year 2). Objects previously discovered in this tomb and now found in museums in Egypt and the UK were also reviewed. Our analysis proved that, contrary to earlier reports, Pepy-ankh-hery-ib was the first individual to build a tomb at Meir (in the first half of the Sixth Dynasty), and the art and architecture of his great tomb became a source of inspiration for later generations. Comparisons were then made with tombs from the latter part of the Old Kingdom and from the earlier part of the Middle Kingdom, including the tombs of Ny-ankh-Pepy-kem and Pepy-ankh-heny-kem, the last two Old Kingdom governors of Meir. The scenes and inscriptions in these tombs were cleaned by the Conservation Department of the (then) Egyptian Supreme Council of Antiquities in 2011, revealing important new information overlooked in the earlier record by Aylward Blackman. ARC APD fellow Linda Evans took up the fellowship on August 1, 2011. Building on her previous studies of the animals represented in Egyptian art, she began working on an environmental history of ancient Egypt, which will examine and summarise current scientific understanding of the country's geography, climate, flora, and fauna during the pharaonic period and evaluate the impact of natural phenomena on Egyptian cultural expression (with a special focus on the site of Meir). Also in Year 1, PhD candidate Miral Lashien was appointed to the project and began work on reconstructing the complex genealogical history of the site. Volume 1 of the project excavation monographs was published in December, 2012: Kanawati, N., The Cemetery of Meir vol. 1: The Tomb of Pepyankh the Middle (ACE Reports 31; Oxford, 2012), with a book chapter on 'Architecture' by Alex Woods. During the Year 2 fieldwork season (November 2012 - February 2013), work on the tombs of Ny-ankh-Pepy-kem and Pepy-ankh-heny-kem was completed. 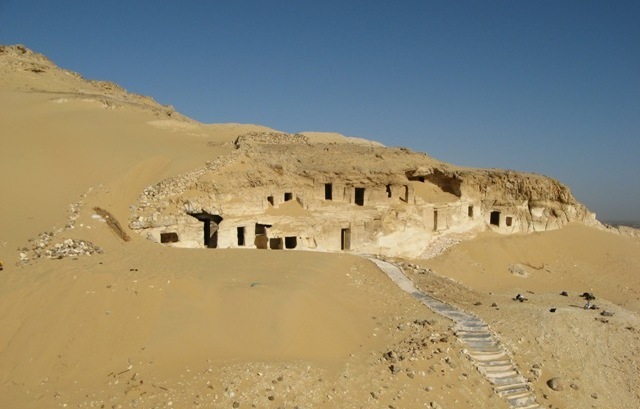 The Middle Kingdom tombs of Senbi (B1) and Ukh-hotep (B2) were also re-recorded, and excavations in the area between the Old and Middle Kingdom tomb structures completed, during which decorated coffin fragments dating from the First Intermediate Period (FIP) were uncovered. Inscriptions on these revealed that the owners were the descendants of the site's Old Kingdom inhabitants. While the FIP tombs at the site are uniformly undecorated, we found that the scenes that had previously adorned the walls of Old Kingdom tombs were now transferred to the inner and outer surfaces of the coffins. It thus appears that the coffins provided a conduit through which artistic traditions were sustained from the Old to the Middle Kingdom period. APD Evans continued her work on an environmental history of ancient Egypt, completing the extensive opening chapter ('Environment and culture'). Project PhD candidate, Miral Lashien, also completed two thesis chapters and presented aspects of her work in late 2012 during a student conference at Macquarie University. The 2013 fieldwork season, which was to have taken place between November 2013 and February 2014, was postponed until mid-2014 due to the current political situation in Egypt. Lashien, M., The Chapel of Kahai and His Family (ACE Reports 33; Oxford, 2013). Lashien, M., The ultimate destination: Decoration of Kaiemakh's burial chamber reconsidered, Études et Travaux (2013), 404-415. The third excavation volume will be prepared this year (with a view to publication in early 2015), which will be devoted to the tomb of Ny-ankh-Pepy-kem and the FIP coffin fragments uncovered during the last fieldwork season. The Middle Kingdom tombs will be published in 2016. The team will also present their findings at two international conferences in 2014. Accepted abstracts for the 6th International Old Kingdom Art and Archaeology conference, University of Warsaw, in July 2014, are: 'A unique burial of a father and a son: Niankhpepy the Black and Pepyankh the Black of Meir' (Kanawati) and 'The art in the tomb of Pepyankh the Middle of Meir: Innovation or copying?' (Lashien). (Note: Linda Evans and Alex Woods will co-present findings from an earlier study at the meeting). In addition, APD Evans will showcase work from her environmental study at the conference, Profane Landscapes, Sacred Spaces, to be held by the Czech Institute of Archaeology, Charles University, Prague, in late June 2014. The title of her paper is: 'Ancient Egyptian and Egyptological perceptions of the natural world'. Kanawati, N., The Cemetery of Meir Vol. I: The Tomb of Pepyankh the Middle (ACE Reports 31; Oxford, 2012). Kanawati, N. and Evans, L., The Cemetery of Meir Vol. II: The Tomb of Pepy-ankh the Black (ACE Reports 34; Oxford, 2014). Woods, A., 'Architecture' in Kanawati, N., The Cemetery of Meir Vol. I: The Tomb of Pepyankh the Middle (ACE Reports 31; Oxford, 2012), 27-31. Blackman, A., The Rock Tombs of Meir, Vol. I: The Tomb-Chapel of Ukh-hotp's Son Senbi (London, 1914). Blackman, A., The Rock Tombs of Meir, Vol. II: The Tomb-Chapel of Senbi's Son Ukh-hotp (B, No. 2) (London, 1915). Blackman, A., The Rock Tombs of Meir, Vol. III: The Tomb-Chapel of Ukh-hotp Son of Ukh-hotp and Mersi (B, No. 4) (London, 1915). Blackman, A., The Rock Tombs of Meir, Vol. IV: The Tomb-Chapel of Pepi'onkh the Middle Son of Sebkhotpe and Pekhernefert (D, No. 2) (London, 1924). Blackman, A., The Rock Tombs of Meir, Vol. V: The Tomb-Chapels A, No. 1 (that of Ni-'ankh-pepi the Black) A, No. 2 (that of Pepi'onkh with the "Good Name" of Heny the Black), A, No. 4 (that of Hepi the Black), D, No. 1 (that of Pepi), and E, Nos. 1-4 (those of Meniu, Nenki, Pepi'onkh and Tjetu) (London, 1953). Blackman, A., The Rock Tombs of Meir, Vol. VI: The Tomb-Chapels of Ukhhotpe Son of Iam (A, No. 3), Senbi Son of Ukhhotpe Son of Senbi (B, No. 3), and Ukhhotpe Son of Ukhhotpe and Heny-hery-ib (London, 1953). Chassinat, É., Notes prises a Meir, Recueil de traveaux relatifs à la philologie et à l'archéologie égyptiennes et assyriennes 22 (1899), 73-79. Chassinat, É., À propos d'un bas-relief du tombeau de Senbi à Meir, Bulletin de l'Institut français d'archéologie orientale 10 (1912), 169-173. Clédat, J., Notes archéologiques et philologiques, Bulletin de l'Institut français d'archéologie orientale 1 (1901), 87-97. Clédat, J., Notes sur quelques figures Égyptiennes, Bulletin de l'Institut français d'archéologie orientale 1 (1901), 21-24. Corteggiani, J.-P., Une statuette inédite du Moyen Empire, Bulletin de l'Institut français d'archéologie orientale 75 (1975), 311-320. Gillam, R., From Meir to Quseir el-Amarna and back again: The Cusite in SAT and on the ground in A. Woods, A. McFarlane and S. Binder (eds), Egyptian Culture and Society: Studies in Honour of Naguib Kanawati, Vol. 1 (Cairo, 2010), 131-158. Kamal, A., Fouilles á Méîr, Annales du Service Antiquités de l'Égypte 14 (1914), 73-87. Kamal, A., Fouilles á Méîr (4 Mai 1913), Annales du Service Antiquités de l'Égypte 15 (1915a), 198-206. Kamal, A., Le tombeau nouveau de Méîr, Annales du Service Antiquités de l'Égypte 15 (1915b), 215-158. Kamal, A., Fouilles à Dara et à Qocéîr el-Amarna, Annales du Service des Antiquités de l'Égypte 12 (1912), 129-133. Kamal, A., Fouilles de Qocéîr el-Amarna, Annales du Service des Antiquités de l'Égypte 12 (1912), 136-142. Legrain, G., Notes sur la nécropole de Meir, Annales du Service des Antiquités de l'Égypte 1 (1900), 65-72. Ragheb, A.A.-R., Notes on diving in ancient Egypt, International Journal of Nautical Archaeology 40.2 (2011), 424-427. Willems, H., Chests of Life: A Study of the Typology and Conceptual Development of Middle Kingdom Standard Class Coffins (Leiden, 1988), passim. **Provides a review of the site, focusing on the coffins.